Growing up in Jemez Pueblo, my dad took me fishing on the Jemez River north of our Pueblo. 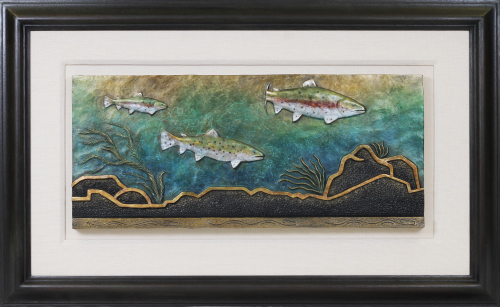 I have a lot of great memories fishing with him for Brown Trout and Rainbow Trout and I created this piece to honor those beautiful memories. At the bottom of the plaque, I placed a design of a Horned Water Serpent. You see this design in a lot of the Santa Clara Pueblo pottery. We (the Pueblo People) believe this water serpent lives in our streams and is a protector and bringer of life to the underwater world. I used different textures to create a feeling of river water moving through the piece.